Young Playwrights for Change is a new, emerging program from the Dramatic Change project that has been in development for over a year. Theatre for Young Audiences/USA and the American Alliance for Theatre and Education have been partnering for the first time in a really major way to pioneer the initiative. Our first Dramatic Change project culminated with an incredible one day pre-conference at the 2012 AATE National Conference in Lexington, KY . The committee received over 30 proposals for the one day event and eight companies were invited to present their inspiring work on using drama as a tool against bullying. Our next project for 2013-14 will be Young Playwrights for Change. Middle school playwrights from across the country will have the opportunity to submit their plays that address the problematic issue of bullying to local and state competitions hosted by theatre companies, universities, schools, and state Theater in Our Schools conferences in their area. Each local winner will be entered into the national competition and one finalist will have the chance to see their play performed in a staged reading by professional actors at The Kennedy Center. Winning scripts will also be available online to teachers as a classroom resource giving young voices the chance to communicate to their peers their ideas, thoughts, and feelings directly in an educational and creative way. 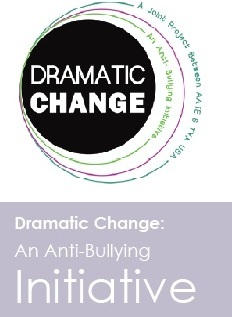 The Young Playwrights for Change Committee is very excited about the potential of this project, especially as the AATE conference draws nearer where final big plans and announcements about the initiative will be released (join our session at 2:15 on Thursday July 25th)! YPC hopes to inspire its participants and audience to consider the power of art, storytelling, and theatre to convey important messages and ideas in an effort to make change for the better. We hope you appreciate this project as much as we do because it will be a rewarding experience for all involved at any and every level of the process. Educating others through theatre about the significance and impact of issues such as bullying is one of the main staples of this initiative and giving youth the opportunity to express to their peers ideas, feelings, consequences, and solutions is one of the greatest ways to make progress. Check here for future postings about YPC from committee members and other artists working on the project to learn about all of the exciting things that are to come! Want to download all of the information about the competition including rules and guidelines? Interested in hosting a regional competition in your area? Click Here! Need more information? Questions? Email Khari Shelton at kharis@assitej-usa.org for information on joining the Young Playwrights for Change committee or to get more details on how to host your own regional competition. Next PostYoung Playwrights for Change: What if I win?